Hosts to Date : Stephen Cain (Deceased), Cori Edwards (Now Battle Guyver), Guyver Faye and human Faye, Guyver US, Warrior Guyver and Warrior Guyver 2. Weight : Adds ~227 kg (~500 pounds) to host mass. Appearance : Varies with each host unit. Description: The Aceaer unit is an advance modern example of non-bio-boosting Gen power armour. 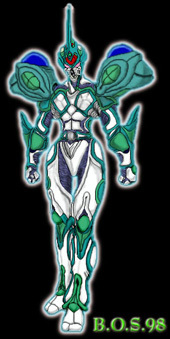 Developed by the Gen to give themselves the approximate power of a Guyver and an integral part of the Kavzar warrior race, serving as the first step in their development into Kavzar. First discovered in Area 51, from the salvaged wreckage of a Gen scout craft, and then later recovered by the ACTF. The Aceaer Unit has fast become an extremely useful and versatile tool that has been used by the best that ACTF has to offer. Nearly equal to the power of a standard Guyver on a human host, the Aceaer unit can also be used to add additional power to any known type of Guyver, including the Warrior Guyver type, with different and varying results. So far only the following types of hosts have been tested by ACTF using the Aceaer Unit. The results of these tests have been documented and can be seen below. Description: The Aceaer unit, an advance non-bio-boosting Gen power armour, is now available to be utilized by one of our most elite soldiers. Nearly equal to a Guyver and combined with the combat skills of a trained soldier, the Aceaer unit is one of the most useful advanced Gen tools that has been added to the ACTF arsenal. First used by one of our top Marines, Stephen Cain, the Aceaer proved an effective weapon in the war against Chronos. But since the death of Stephen Cain in the line of duty, the Aceaer has since been prioritized for use by already enhanced ACTF soldiers, such as the Guyvers. -Physical strength has been approximated to be nearly equal to that of a normal Guyver which possesses the strength of one hundred men. -Stamina is only limited to that of user since the unit possesses a hyper space power link that provides it with limitless energy reserves. -Physical speed is usually limited to that of user with only slight increase in mobility due to the unit’s strength enhancements but provides standard flight speed of 300 MPH, which approximates that of a standard Guyver. 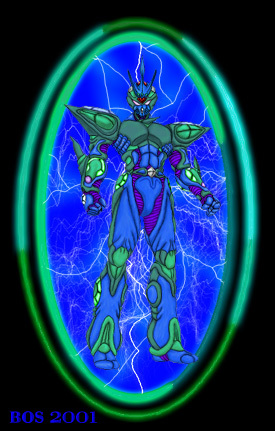 -Durability is roughly equal to that of a standard Guyver but is augmented by a full body protective energy field that dampens the effectiveness of most attacks, this offsets the units inability to regenerate user from fatale levels of damage, though unit can regenerate host from anything short of an instantly fatale injury and can regenerate itself with as little as 5 percent of its normal mass remaining intact. -Instead of the usual Guyver Control Medal and head beam laser, Aceaer unit possesses a bio-laser orb which exceeds the energy output of a standard Guyvers head beam laser by about twenty five percent in burst mode but is weaker when used continuously by ten percent. -The Aceaers gravitational powers are roughly the same as a standard Guyvers. -The unit possesses a pair of retractable arm mounted plasma swords that approximates the Guyvers vibrational swords by using a highly efficient kinetic energy transfer plasma field instead of vibrational material. The unit also utilizes the same kinetic plasma technology for its sonic weapon emitters which allow it to be used even in the vacuum of space though power levels still only approximate those of a standard Guyvers. -The unit possesses what is generally known as a Rail Gun, an E.M. pulse device that fires small metallic projectiles at near the speed of light, on each forearm and can inflict a considerable amount of damage to any unshielded target. -In place of the Guyver Mega-Smashers, the Aceaer possesses shoulder mounted fusion cannons of nearly equal destructive power but has shorter range due to rapidly expanding nature of blast. Both fusion cannons can also be fired together, at one target, or individually at multiple targets. Also being the Aceaers most powerful weapon that it severely drains the units energy reserves, temporarily weakening units overall power levels, and requires nearly twice the charging time of a standard Guyvers Mega-Smashers. -Unit possesses hyper sensors similar to a standard Guyver but since unit does not directly access the users mind that unit processes the information from sensors and uses it to produce a H.U.D. like display as well as augment the users natural senses to compensate for lack of a direct sensory link to users mind. 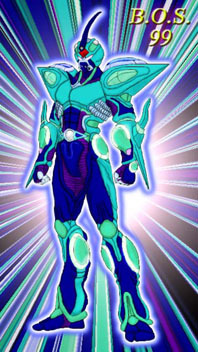 Description: The Aceaer unit, when activated by a Guyver, serves as a upgrade module. Adding its power to that of the host unit, providing the Guyver a power boost nearly as great as a Gigantic Unit. -Physical strength is doubled to that of 200 men. -Stamina is limited to normal parameters for a standard Guyver but Aceaer helps elevate some of the strain of using the unit on host and thus gives a slight increase in overall stamina. -Physical speed is only slightly boosted on the ground, allowing a Guyver to reach a top speed of 300 MPH. Flight speed is doubled due to the extra gravity control orb of the Aceaer, allowing a Guyver to reach a top speed of 600 MPH. Reflex speed is unaffected. -Durability is roughly doubled that of a standard Guyver and is augmented by a full body protective energy field that dampens the effectiveness of most attacks. Regeneration is only slightly enhanced as Aceaer assists host units natural regenerative ability, allowing host Guyver to regenerate at almost twice the normal rate, but is dependant on how much the Aceaer unit has received as it regenerate itself as well. Use of pressure cannon shield also allows host unit to withstand a mega smasher level attack. -The Aceaer units bio-laser orb lays on top of the host unit head beam orb and combines their power when fired. Doubling overall effectiveness of this weapon. -Gravitational powers are roughly the same as a standard Guyvers and combines its power with the host units for double the normal range of power. -The Aceaer units plasma swords combine with the host units vibrational swords, combining their power. -Hyper sensors and host sensory perceptions are both boosted by the Aceaer unit. Granting a unit twice its normal sensory range and the host with a far wider range of sensory enhancements. 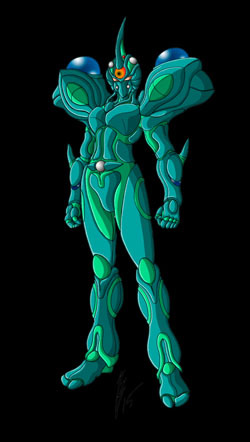 Description: The Aceaer unit, an advance non-bio-boosting Gen power armour, has been utilized by the Warrior Guyver. Significantly increasing his already considerable power. Though rarely used now that he has merged with a Matrix and acquired the Dreadnought Gigantic Unit, the Aceaer still serves an emergency situational use, to be either temporarily granted to an ally or for those rare occasions that the subject over strains his powers and reverts to his previous Warrior Guyver form. The Aceaer unit remains one of the most useful advanced Gen tools now in ACTF control. Consequently the three Aceaer units are constantly being shifted around as needed. -Physical strength is boosted 40% to that of 560 men, due to units partial merging when used on a Warrior Unit. 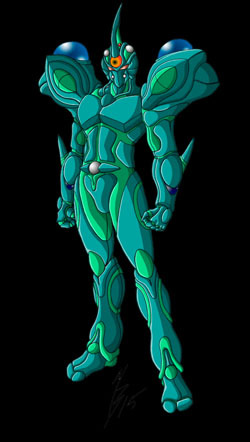 -Stamina is unlimited due to the HSL system that both the Warrior Guyver and Aceaer unit possess. -Physical speed is boosted, giving a top ground speed of 770 MPH and a top flight speed of 4,500 MPH. -Durability is increased by 40% as the Aceaer defensive systems combine with the Warrior Guyvers. Significant increase is mostly due to fact that the Aceaer shield system gets improved when linked to the powerful control systems of the Warrior Unit, allowing for an improved and more powerful shield system. -Aceaer units bio-laser orb adds its power to the Warrior Guyvers head beam and increases maximum energy output to 14 times that of a normal Guyver. -The Aceaer units gravity control orb integrates itself with the Warrior Units and increases power by nearly 40%. -The Aceaer units plasma swords combine with the Warrior Guyvers polymorphic vibrational swords to improve weapon effectiveness by approximately 40%. -The Aceaer units Rail Gun, an E.M. pulse device that fires small metallic projectiles at near the speed of light, is added to each forearm of the Warrior Guyver and can inflict a considerable amount of damage to any unshielded target. -The Aceaer shoulder mounted fusion cannons, take on a more streamline appearance. Taking advantage of its link with the Warrior Unit to improve performance to a level that allows them to be used in tandem with the Warrior Guyvers own mega smashers, without the usually drain on the Aceaer that is normally produced and with quicker recharge time. Destructive output is otherwise unchanged, unless combined with subjects other weapons. -Sensory enhancement is similar to how a standard Guyver is enhanced by the Aceaer unit but since the Warrior Unit already has a vast range of sensory enhancements, the Aceaer primary just helps boost effective range by about 30%. Description: The Aceaer unit, an advance non-bio-boosting Gen power armour, is now being utilized by one of our most elite Marine soldiers. Nearly equal to a Guyver and combined with the combat skills of Stephen Cain, the host of the Warrior Guyver 2, the Aceaer unit is one of the most useful advanced Gen tools now in ACTF control. This combined with its many enhancements when activated on a Warrior Unit, continue to validate the value of these units in our war with Chronos and their ever increasing level of power. -Physical strength is boosted 40% to that of 560 men, due to units partial merging when used on a Warrior Unit. This is increased slightly when the Warrior Guyver 2 utilizes his units CPM’s to boost his strength, resulting in a maximum strength level of 1,000 men. -Physical speed is boosted, giving a top ground speed of 770 MPH and a top flight speed of 4,500 MPH. Though use of the CPM’s roughly doubles the subjects speed. -Durability is increased by 40% as the Aceaer defensive systems combine with the Warrior Guyver 2’s. Significant increase is mostly due to fact that the Aceaer shield system gets improved when linked to the powerful control systems of the Warrior Unit, allowing for an improved and more powerful shield system. Though unlike the Warrior Guyver, these benefits are highly dependant on the the Warrior Guyver 2’s use of his CPM’s. -Aceaer units bio-laser orb adds its power to all three of the Warrior Guyver 2’s head beams and increases maximum energy output to 40 times that of a normal Guyver.